Castle, the leader in brushless technology for RC cars, is pleased to announce the release of our new Mamba Max Pro brushless ESC featuring SMARTSENSE operation. SMARTSENSE brings the best of sensored and sensorless ESC together to create the ideal controller for serious 1/10th scale enthusiasts. Operating at up to 6S, Mamba Max Pro can handle nearly twice the power of the market standard Mamba Max! Castle Builds A Sensorless Controller? Hey, were never going to just go with the flow, so weve built the best of both worlds into the new controller. SmartSense uses the motor sensors to start the motor and then it switches over to Castle ultra powerful and efficient dynamic sensorless mode which boosts motor efficiency. Simply put, youll get more power and less heat from your motor. Sensored Only mode runs sensored motors using sensored timing only. CHEAT MODE, Castle High Energy Advanced Timing allows users to electronically advance their sensored motor timing to extreme settings. This can often yield just that extra bit of power needed to win the race. Be careful there never a free lunch, extra power comes with extra motor heat! OK, now Im confused. Is Sensored better than Sensorless? The answer is that for most users, Sensorless operation is still better. Castle Sensorless controllers offer best in class start up and braking which are fine for most users. Sensored only motor operation cannot deliver maximum efficiency. Sensors are terribly inaccurate for motor timing purposes as the motor magnetic fields change under load or at speed; that where Sensorless operation shines. Sensorless is also just more dependable. There are fewer wires and connections that need to survive the incredibly rough treatment most RC cars and trucks endure. Some guys do need sensored operation, mainly because the racing world rules require it, but also because it can offer slightly better start up and braking performance. 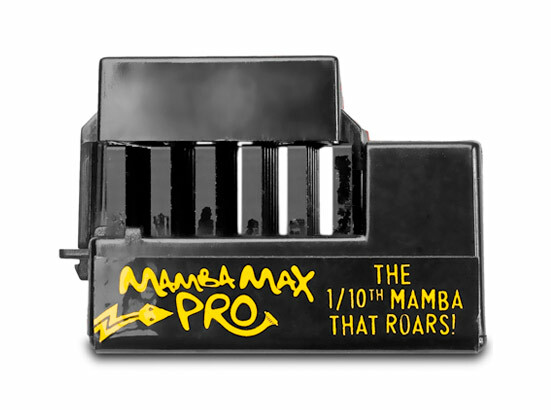 Mamba Max Pro offers the ultimate in flexibility: use it with all your 1/10th motors, sensored or sensorless! Im over the shock of the sensor port. Tell me what else youve packed into the Mamba Max Pro. Switching BEC powers your radio and servo all the way up to the 6S max input. Users may select the output for any voltage between 5V and 7V. Ready to Run: Mamba Max Pro is ready to run out of the box. Castle Link Compatible: Like all Castle controllers, the Mamba Max Pro may also be tuned for the drivers preferences in the throttle curve, brake strength, reversing modes and more. Access these features with the Castle Link USB connector (sold separately) and a PC for even more versatility.